Tom has a loose, impressionist approach to painting and in this film he shows us how to simplify and capture the essence of a subject, painting in watercolour. He starts by painting an English meadow in the evening light and then travels to Brittany in Northern France where he paints a series of watercolours, full of life and movement. These include beach scenes with figures, boats, buildings - even a horse - as well as a view from his balcony in Jugon les Lacs. Tom Coates is a master of capturing the essence of a subject, and in Simplifying Watercolour he shows us how to approach colour and form and concentrate on the harmony of the landscape in order to convey the sense of mood and place successfully. He paints a variety of subjects near his home in Hampshire as well as in Brittany, and in addition to advice on technique, he includes plenty of useful comments on sketching, materials, composition, painting figures and other related topics. Tom Coates is a member and sometime president of an impressive list of societies, and currently holds this post at the New English Art Club. His style is free and direct, untrammelled by any rules. 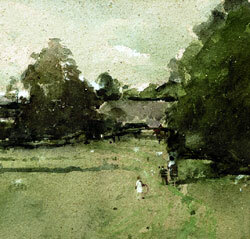 In his film, Simplifying Watercolour, he tackles various landscape subjects opening with a couple of views of a very English meadow. He shows how he starts without any underdrawing, sketching out his compositions with a rigger brush, and loosely washing in larger areas with a mop. Once the larger shapes are established he indicates smaller details such as sheep and figures to create a sense of scale. Unusually he uses chalk rather than masking fluid to retain highlights which he finds works most of the time! The venue then moves to France where he works on medium-scale paintings, whilst simultaneously jotting down small studies in a pocket sketchbook for future reference. The first is a wide beach scene at Pen Guen, where, conveniently, a horse and rider come into view and meander through the gently breaking waves. Further interest is added in the form of people with metal detectors and children playing on the sand. 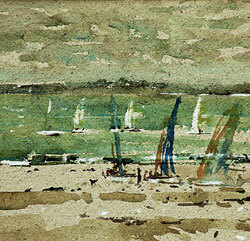 Later sketches include compositions of boats and figures along another stretch of coast. A rural scene painted from the balcony of his lodgings in Jugon les Lacs, offers an interesting juxtaposition of shapes � rooftops, roads, walkways, a lake; all intersecting and dropping away to create an unusual sense of perspective. He returns to this later to redefine the contrasts and add smaller details. Coates has a relaxed style that is fascinating to watch. His compositions evolve unexpectedly and always retain a fresh quality however much he works into them. His method encourages the viewer to break from traditional approaches, and to simply enjoy the process of capturing the essence of what is before them. An excellent video, informative and extremely helpful to me since I have more experience with oils than watercolours. 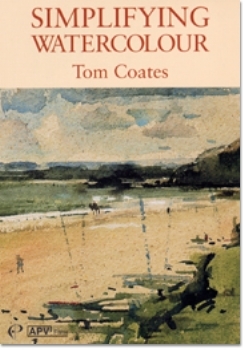 Tom Coates makes his style of painting look effortless but of course it`s not! A very good buy, and one that i go back to time and time again.